Star Trek fans will certainly like this. If you have a recent event in Google Calendar that contains "Star Trek", Google will automatically add a calendar titled "Stardates". "Our team has been pretty excited about a certain movie premiering today. After yet another discussion of starships, phasers, and warp drives, we decided to put our enthusiasm to work and give Calendar a little boost. The result was the creation of a new calendar, pre-loaded with stardates to help you keep track of time in this universe and beyond," explains Google. "A stardate is a means of specifying absolute dates in the fictional Star Trek universe. They are decimal numbers, usually rounded to a single decimal place, which replace absolute Gregorian calendar dates," according to Wikipedia. To see the stardates calendar, create an event that includes "Star Trek" in the title and refresh Google Calendar. You should notice the new calendar in the left sidebar. Another way to take a look at the calendar is to sign out from Google and then visit Google Calendar's homepage. This is cool but ... why don't they work on fixing that annoying bug where it lists the time twice when I type in a new event? you know the one ... "4pm happy hour" gets auto entered in as "4pm 4pm happy hour". Awesome! 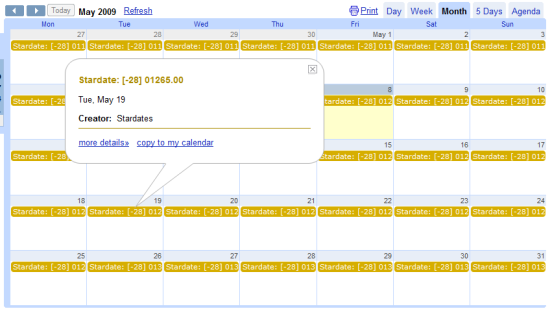 It was a nice surprise to see my Google calendar populated with stardates! I don't have any "Star Trek" events but the Stardates have been added to my calendar. How do I get rid of them? Go to the settings page, select the "Calendars" tab and click on "Unsubscribe" next to the Stardates calendar. Captain's log [long pause] stardate [long pause] Iiii [pause] don't know what the date is, because it's not [pause] appearing on my calendar. Or to put it another way... the stardate calendar is not appearing for me, does the trigger event have to be in the past maybe? I'm going to see the film this weekend. They showed up on mine, but I wasn't too happy about it. I know, I know...I need to stop being a stick in the mud. But, if I wanted them there I would have put them there myself. I do appreciate all the cool stuff that Google has created and done, but flooding my calendar with something that I didn't request isn't exactly what I would consider copacetic. Not happy. Thought someone had been tampering with my google account. They shouldn't piss about with individual's accounts without permission. The stardates don't seem to be accurate, according to the Stardate on the wiki pages on the internet. Can anyone help me to add it by giving me the calenders url? Doesn't seem to work for me. Us Google Apps people never get to have any fun. Also I am also ticked about the 4:30 4:30 Happy Hour. Ugh.. Typical, didn't work for me. I had a Star Trek event, been in my calendar for over a month, saw it Friday night, would have really enjoyed the Google calendar surprise. it doesn't work on my calendard. It no longer works, since this was a feature created for a single day. Worked for me when I typed [ stardate: ] in the "Add a friend's calendar" box and hit Enter. I guess the correct way to implement stardates, would be as alternative calendar. However, since star trek the original series use a different approach to stardates than for instance star trek next generation, it might be hard to agree on a standard. Implementing different calendars trying to account for different uses of stardate-systems through out the series, would indeed be a hard task to solve. Esp. since I think some of the stardates are also considering position in space or something like that. (Maybe trying to do things like compensate for time-problems when you cross lightspeed). And , i see that any of the google stardates are true. In all three calculators it gave a whole different number, so i think whoever did that google stardate is messing with other people. It maybe a total fake thing. I want confirmation from people. I lost my trust in google. Please investigate this issue. please explain more on the calculation methodology.